The sight and sound of a red vehicle is turning heads in Taipei. It runs on six wheels, has two floors and open on the top. A double-decker bus! Do you want to experience a joyride? C'mon, it will be fun. Before you get too excited to board the bus. Let me give you some reminders. This sightseeing tour offers different kinds of packages and routes for visitors to enjoy. Ticket prices vary for how long you want to ride the bus and what places do you want to visit. A 4-hour ticket gives you unlimited rides and costs NTD 300. For foreigners residing in Taiwan, just show your ARC and you will get a 50% discount. Yehey! The start of the road trip. 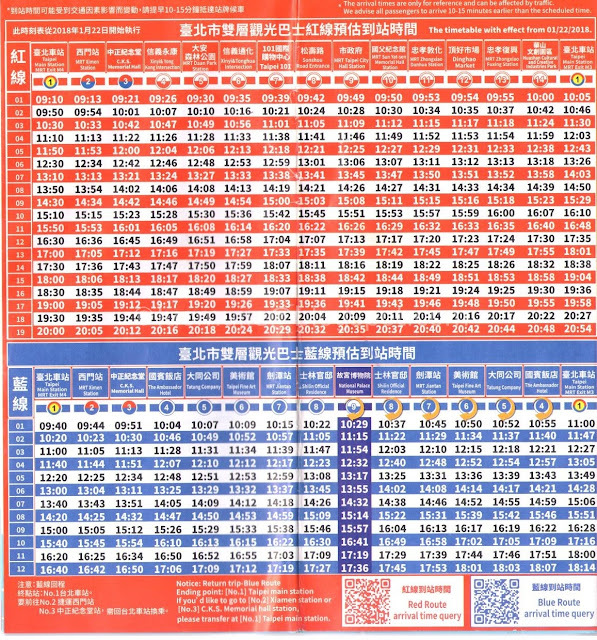 I asked for help from the Visitor Information Center at Taipei Main Station on where to board the sightseeing bus. They pointed me to Exit M4 and I was delighted to see the vehicle parked at the intersection of Zhongxiao West Road and Gongyuan Road. It was waiting for its passengers for the 4:20 pm trip. I decided to board the bus even though it was a hot summer afternoon. The sun was getting ready to set and the sky was blue with some clouds, so the temperature was just right to enjoy the trip. And it really turned out to be a wise decision! I couldn't contain my excitement as I sat on the second floor. I have been to many places in the city but to see the streets of Taipei on a double-decker bus was a different experience. The traffic lights were so close and I could even see their LED lights. Even the street signs were so near that I could reach them with my tripod. Haha! Most of the passengers wanted to sit at the air-conditioned area. audio guide. Just ask the "stewardees" to borrow the earphones. À la Hong Kong. The service of this sightseeing bus started in January 2017 while other Asian cities had also been offering this kind of travel option. But during the early '90s, double-decker buses used to run in some cities on the island like in Taichung. If there had public buses like this in Taipei, imagine a rush hour where everyone wants to get off from the bus. Worst, most of the passengers are still on the second floor. And there is no Easy Card technology yet. So a ticket inspector goes around and squeezes his or her body between people just to collect their bus fares. Bwahaha! Hop on, Hop off! The slogan of Taipei's double-decker bus. Visitors can get off and ride again at the designated bus stops to explore the city on their own. A new way to wander in Taipei aside from the thousands of classic MRT tours that you can read on the internet. The Red Route takes tourist to the Red House in Ximending then passes by the Chiang Kai-Shek Memorial Hall. The vehicle will then go to Taipei 101 with Yongkang Street and Daan Park as one of the stops then back to Taipei Main Station after passing by Sun Yat-sen Memorial Hall. The Blue Route also runs in the Ximending and Chiang Kai-shek Memorial Hall but its destination will be the National Palace Museum with the Taipei Fine Arts Museum and Shilin Official Residence as part of the major stops. Like magic. Riding on the Red Route, I waited as the bus slowly approaches the majestic Taipei 101. Living here for almost five years, I couldn't remember how many times I have seen Taiwan's tower of power. It's still a different feeling every time I gaze at the tall structure. When the vehicle was about to make a turn at Songzhi Road, the double-decker bus allowed me to look at Xinyi's highest building without the fear of losing my balance. I sat comfortably on the open air second floor while my digicam is pointed to the highest point of “101”. Such things that you won't experience if you are just standing on the ground. A bus ride for all. First-time visitors in Taiwan will surely enjoy the riding this new mode of transportation designed for tourists. Ride and get off at your destination. Explore the city on your own with the Taipei Sightseeing Hop On Hop Off Bus. Hurry! The “double-decker” is waiting for you. Beep! Beep! *50% discount are given to Taiwanese citizens and foreigners with ARC. Just show your ID. *Passengers without tickets can board the bus and pay the fare to the “stewardess” while the bus is already running. *The “stewardess” will ask you which stop do you want to get off and the tickets will be cheaper if you are going to alight at a certain stop. For the Red Route, some locals board the vehicle at Taipei Main Station and then get off the bus at MRT Taipei City Hall Station. *If you happen to sleep during the ride and wake up at the terminal in Taipei Main Station. Board the bus again in front of Exit M4. Remember that you can ride the double-decker bus for an unlimited number of times depending on the type your ticket. *Ridership is very low for the Taipei Double-Decker Bus. Let us support this project of the Taipei City government. Nobody knows how long this tourist bus will be available for everyone. The service can be suspended if found to be not beneficial and profitable anymore. Red Line: first bus at 9:10, last bus at 20:00, Taipei Main Station to National Palace Museum. Blue Line: first bus at 9:40, last bus at 16:40, Taipei Main Station to Taipei 101.